And they had plucked the feathers from his wings. I can see no traces of the arrows and quiver, but those can indeed be feathers, not palm branches. I don't know. There is much poetry in the Renaissance about disarming Cupid- either by taking his Quiver,Bow or plucking his feathers. Love stared dumbfounded at the vision of my Lady. Glance; he too has taken to his heels, swifter than the wind. by her alone are smitten. Love strays, defeated and disarmed. I came upon Love among the Roses. His feathers tickle my insides. I'll go back today and see if I can get the whole painting. It's hard because we are not allowed to use flash, or any tripods or such, and it is in a fairly dark room... in other words, it's tough to get photos. Nevertheless, I'm grateful that we are allowed to use cameras at all, so I'll give it another go before they change their minds! 6BC? But it sounds so modern! robert wrote: I'll go back today and see if I can get the whole painting. It's hard because we are not allowed to use flash, or any tripods or such, and it is in a fairly dark room... in other words, it's tough to get photos. Nevertheless, I'm grateful that we are allowed to use cameras at all, so I'll give it another go before they change their minds! even if you cannot take better photographs (and those you have posted are very good) it is possible that a close examination will allow you to understand more of the painting. I think I favour the “palm” idea, maybe because I have seen it in so many images of virgin martyrs, and this widespread symbol seems to fit well with this context. But the text also explicitly refers to some ladies picking Love's feathers, so it is not obvious to me which interpretation is the correct one. Another precipice or cliff edge, from a post by mikeh on this thread. I've been looking at miniatures and engravings from 14th-15th century Northern Italy; many have precipices. For miniatures, here is what I find in the book Treasures of a Lost Art: Italian Manuscript Painting of the Middle Ages and Renaissance: There is a series of small cliffs, ending with a cliff at the bottom border, in a crucifixion by Niccolo da Bologna, 1390-1400 Bologna. One is at the bottom of a Temptation of Saint Benedict, 1440-1410 Abruzzi. There is a precipice at the bottom of a Stoning of Saint Stephen, 1455-1460 Ferrara (part of a series initiated in Bologna), by Franco dei Russi; and a rather large one at the bottom of a Temptation of Saint Francis, c. 1460, Bologna, by Bartolomeo del Tintore. 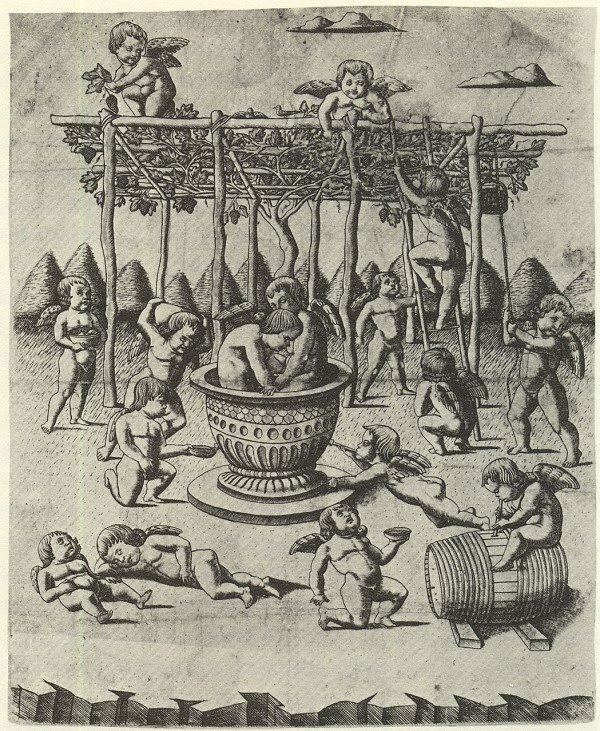 For engravings, in Gisele Lambert's Les Premieres Gravures Italiennes, there are, from Florence (precipice on lower border unless otherwise indicated): a nativity, Lambert's #128, from 1460's; Saturn #129, Jupiter 131, Mars 132 (with water on the right, suggesting that it is a bank of a body of water), Sol 133, Venus (river bank) 135, all early 1460's, possibly by Baldini; Sibyls of Persia 162, Libya 163, Samos 164 ( with water surrounding), and the Tiber 171, all early 1470s (the other Sibyls are on clouds), same artist. Illustrations to Dante's Inferno #184, 186, 187, all 1480's; a Hell 196 (dividing levels), 1480s, all possibly by Rosselli; Rosselli's Triumphs of Death 237, Fame 238, and Time 239, all 1470s or 1480s. A "Moses and the Bronze Serpent" 209, 1470s-1490s. In Mantegna's engravings, 1470's Mantua, there are a Flagellation 408, and Descent from the Cross 409 and 410. Kaplan, Vol. 2 p. 143, has a Triumph of Love attributed to Rosselli, a precipice at the bottom. In the other Rosselli Triumphs that he reproduces, the precipices are less distinct than in Lambert. In Levenson et al, Engravings from the National Gallery of Art, there are many of the above plus a 1470 crucifixion drawing by Rosselli and an engraving after Pollaiuolo's Hercules and the Giants (a scene of slaughter), both with precipices at the bottom. Hind, Early Italian Engravings 1938, has many of the above plus a Triumph of Love, Plate 18, c. 1460, different from the Rosselli, and a "Wild Animals attacking Horses and Oxen," Plate 88, c. 1460, both Florentine. I also looked in Roettgen's Italian Frescoes: The Early Renaissance. A precipice along the lower border occurs in Giovanni da Modena's Three Kings cycle, Bolognini Chapel, San Petronio Basilica, Bologna, c. 1410. They also appear in Francesco del Cossa's March, April, and May upper frescoes at the Schifanoia Palace, Ferrara, c. 1469, and in Fra Lippo Lippi's "Domition of Mary" in the Spoleto Duomo, c. 1465. To delineate a seashore, a small one is in Ottaviano Nelli's St. Augustine cycle, Gobbio, after 1400; and Benozzo Gozzoli's St. Augustine cycle, c. 1465, San Gimignano. Gozzoli also has precipices as mountain sides within his frescoes, there and his Three Kings cycle for the Medici Palace in Florence, c. 1459. That's all for the moment. I hesitate to generalize from my small sample (in particular, I'd like to see more from Padua), but perhaps we can say that the motif was used early in Bologna, and later taken up in Florence and elsewhere. it seems to be associated with death or at least danger, although it also has other functions, such as providing a stage or separating scenes. I dont know whether the Justice had no precipice. Perhaps she had, but was deleted. In the copy I have (web Vitali), it seems that the ground was green and had an edge... in the past. Another question. I dont know whats mind our PMB's cliff, but is common in fantasy literature of the Middle Ages and the Renaissance, the fantastic travell start to cross a river, a cliff, a forest or other natural limit. Are boundaries between what is on the earth, normal, and the supernatural (such as allegories).